Shout! Factory has announced that they will release P.A. 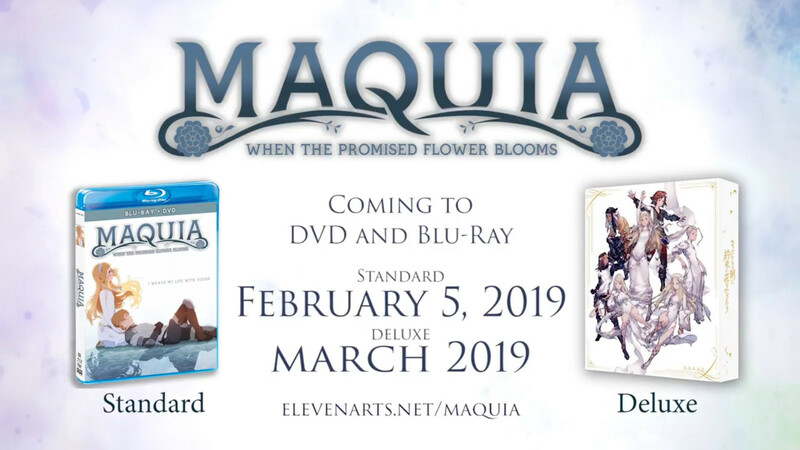 Works and Mari Okada’s Maquia: When the Promised Flower Blooms on home video in cooperation with Eleven Arts. The film will have two different versions available, a standard edition and a deluxe edition. The standard edition will be a Blu-ray/DVD combo pack. The deluxe edition comes with a special box, a blu-ray with additional bonus features, an 80-page booklet and a short scenario written by Mari Okada. Right Stuf will distribute the deluxe edition. You can check out the trailer for the home video release below. The standard edition is slated to release on February 5, 2019. The deluxe edition will release a month later in March 2019. The home video release will include both the original Japanese audio and English dubs. The vertical threads are the passing days. The horizontal ones are the lives of mankind. The people of Iorph live faraway from the lands of men, weaving the happenings of each day into a fabric called Hibiol. They live for centuries, yet maintain their youthful appearance. For this, they are known as “The Clan of the Separated” and are treated as a living legend. Maquia, an orphaned Iorph girl, lives her life in an oasis surrounded by friends, but somehow feels “alone”. But the tranquil lives of the Iorph are shattered in an instant when the Mezarte army invades their territory on a dragon fleet, seeking the blood that grants the Iorph long life. Amidst the despair and chaos, Maquia’s friend Leilia, the most beautiful of the Iolph girls, is kidnapped by the Mezarte in their plot to thicken the royal blood with longevity. Krim, a young boy with whom Maquia harbors a quiet infatuation, goes missing. Maquia manages to escape, but loses her friends and her home. As she wanders through a dark forest with an empty heart, she encounters a baby who is “alone”, his family killed in an ambush. Maquia adopts the baby and names him Ariel, and with the help of some new friends she raises him. But even as time passes, Maquia retains the form of a young girl. As the era changes, the bond between Maquia and Ariel changes too, amidst a backdrop of racial tensions between the Iorph and the Mezarte. This is a story of irreplaceable time, woven by two lonely people who find solace in each other. Maquia: When the Promised Flower Blooms is a film directed and written by Mari Okada. It is produced by P.A. Works. with music by Kenji Kawai. Eleven Arts screened the film with the original Japanese audio in the US and Canada in July 2018. The English dub was screened in September 2018 in the US.